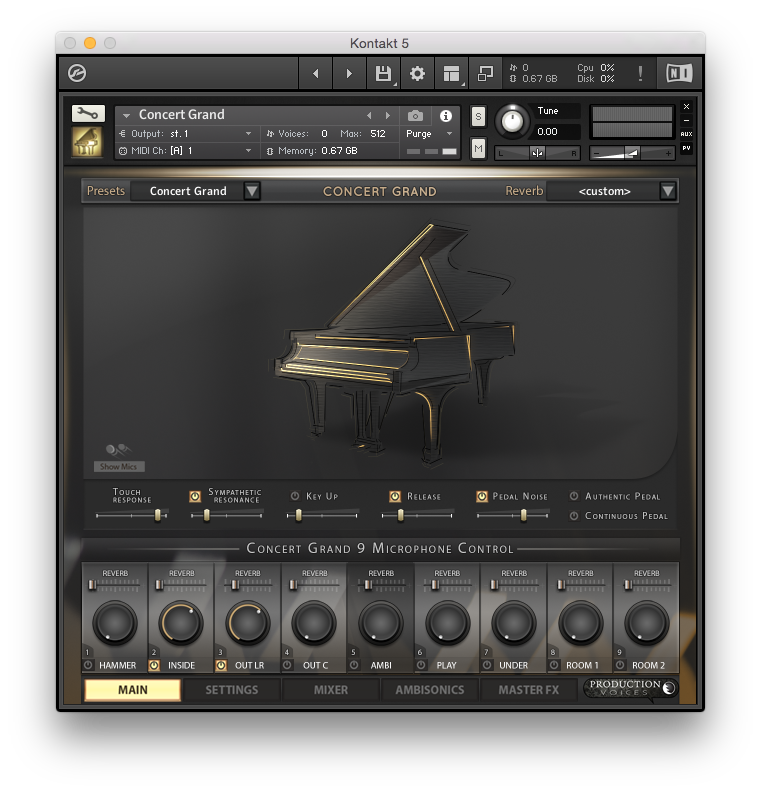 Concert Grand Gold is a premium 299 GB, 9 microphone piano sample library sampled from a Steinway D New York 9′ Concert Grand Piano built for the full version of Kontakt 5.7 and above (not for Kontakt Player). If you listen to classical or jazz piano recordings, chances are that is a Steinway D, the iconic king of the concert stage. For decades, performers have requested the warmth and grandeur of the Steinway sound. It is in heavy contrast to bright pop production pianos found in many recording studios. It’s elegant and refined. Every engineer has a slightly different way of recording such a large instrument and every player wants to hear a different aspect of the sound. This is why Concert Grand’s 9 microphone control is so important. You can dial in a variety of tones with microphone placements that are time-tested by audio engineers. Concert Grand let’s you take control of your sound unlike any piano library before it. The ambisonics channel is a leap forward in sample library flexibility. Be warned! Concert Grand captures all this Steinway has to offer including its thumps and bumps and louder than most mechanical noises. We didn’t strip away the imperfections, but let them contribute to the authentic piano sound. Concert Grand Gold takes the 24 bit 44.1k samples from the larger Concert Grand, our 1.1 TB Steinway D piano library, and makes for a faster loading, amazing sounding virtual instrument piano that is easy to use and inspiring to play! Ambisonics channel provides complete 3D sound of the piano allowing the users to rotate anywhere in a sphere. The virtual microphone can be pointed at the piano or the room. The ambisonics channel was recorded using a Soundfield microphone. Ambisonics is the most flexible audio format allowing for single mic to 5.1 surround and beyond! The player perspective was recorded in near-binaural to sound as if you were sitting at the piano! Carefully selecting microphones, microphone preamps and converters makes all the difference to the sound quality of a sample library. Concert Grand used premium Burl Mothership analog to digital converters to capture the true sound of the piano. API and Neve preamps were used to amplify the Neumann, Royer, RCA, B&K etc. microphones. This is the best signal path imaginable in a studio environment. WARNING!!! Concert Grand is not a product for the meek. It will take a really long time to download. Serving 157+GB to a customer is resource intensive. Concert Grand requires an SSD. You need to buy an SSD. You will be frustrated if you do not run this library from a SSD. Concert Grand is CPU intensive and can tax just about any computer with all options enabled. 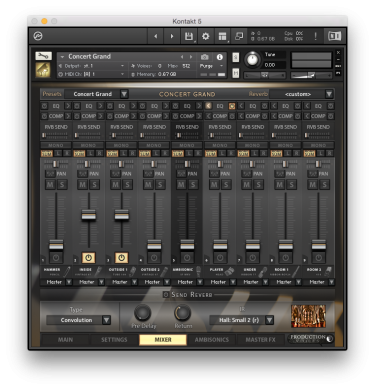 You need the full version of Kontakt, not Kontakt Player. Please do not buy this library if you have never installed a sample library before. Try a smaller library first. Concert Grand is not a perfectly sampled piano. It is not designed to be artificially flawless. If a note had mechanical noise, we left it in. Warts and all, it is snapshot of a large mechanical instrument. Expect a learning curve to get the most out of this library. Expect to invest some time calibrating your MIDI controller for your touch and playing style. Expect to have to adjust Release, Pedal Noise and other settings to best match your expectations of how a piano performs. Consider using a continuously variable sustain pedal with the library. For best results, use a quality weighted controller, such as Kawai VPC. One microphone perspective will likely playback fine with heavy sustain pedal usage, but Kontakt voice count limits the number of mics that can be used with sustain pedal down. Do not expect to play 88 notes X 9 microphones repeatedly resulting in hundreds or thousands of voices being generated without some compromise. No computer can stream a 1000 tracks instantly and flawlessly. We do not take returns. Try the demo before purchasing. Concert Grand is a rewarding instrument that pays back anyone who invests the time to set it up. Concert Grand Gold is upgradable to the full version of Concert Grand. Concert Grand Gold owners can email support for details. Recorded at Phase One Studios in Toronto Ontario Canada with Burl Mothership A/D converters. 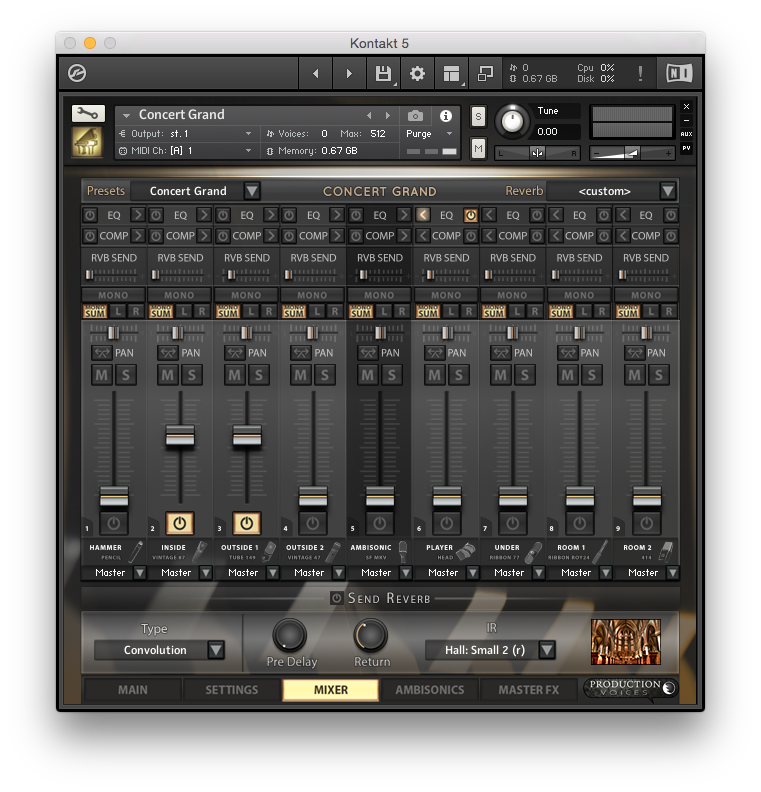 Requires NI Kontakt 5.7 or greater (not included). A computer that meets the minimum Kontakt requirements. 8 GB RAM or more. Solid State Drive or Raid Drive recommended for more than 2 microphone perspectives at one time. 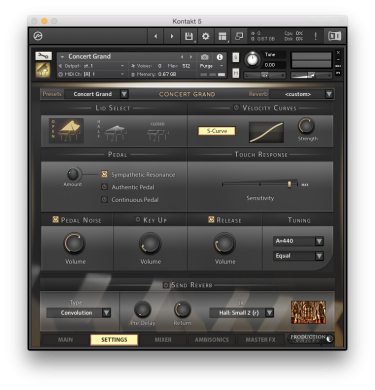 Note: Compatible with the full version of Kontakt only (not included). Not for use with Kontakt Player. 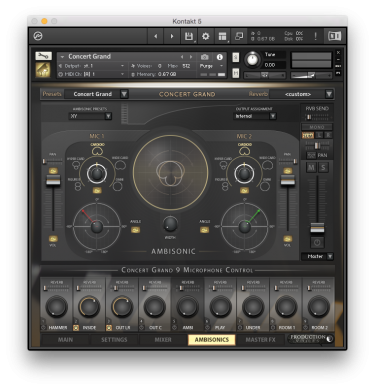 © 2019 Production Voices - Maker of Concert Grand, Production Grand 2 and other professional multi-microphone piano sample libraries for Kontakt 6 and Plogue Sforzando.